Did you know you didn’t need to rely on our title capitalization tool if you use Microsoft Word? Microsoft Word has some basic title capitalization tools that you can use in a pinch if your text is in all caps or has generally messed-up capitalization. Sentence case: Only the first letter of each sentence is capitalized in sentence case. lowercase: Self-explanatory, but this option lowercases all of the letters. UPPERCASE: Also self-explanatory, but all the letters are uppercased. 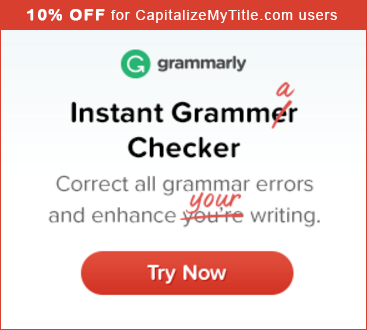 Capitalize Each Word: This style is also known as title case or First Letter and is the most common capitalization method for titles and headlines. tOGGLE cASE: This style will reverse the case of every letter in the selected text. For example, “tHIs IS PoORLy CAPitaLIZED” will change to “ThiS is pOorlY capITAlized”. To actually capitalize words using these options, you just select the text you want the rules to apply to and then select case you want to convert to from the menu (or use the shortcut). PowerPoint has the same capitalization options as Microsoft Word located under the ribbon option “Home” and then “Change Case” (also found with shortcut ALT+H+7). This will make sure all your slide headers use the same capitalization rules. Excel is different from the above two Microsoft products because it is a spreadsheet tool based mostly on formulas and data. However, there are formulas built into Excel that allow for some basic title capitalization. Excel has a built-in formula for converting text to uppercase. It’s simply called “UPPER”. Excel has a built-in formula for converting text to lowercase. It’s simply called “LOWER”. Excel has a built-in formula for converting text to title case. It’s simply called “PROPER”. 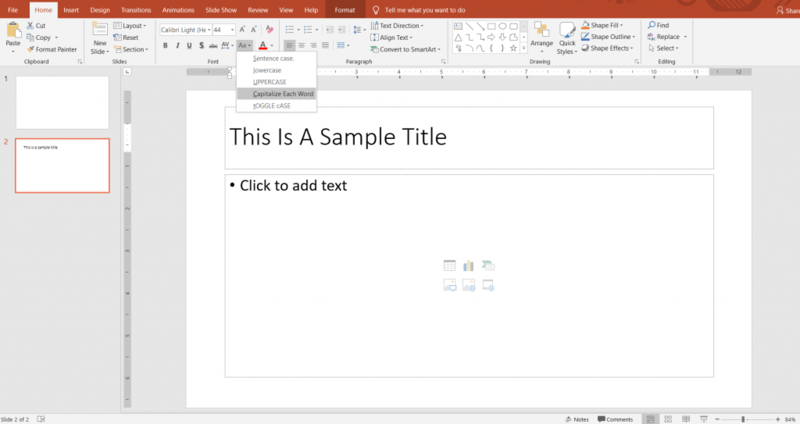 Overall, Microsoft Office has some great tools for capitalizing titles and text. While they don’t offer checks against the latest style guides, they work pretty well. Go ahead, try using the built-in Microsoft Office capitalization tools!